As expected Apple eliminated the headphone jack in the new iPhone 7. Apple launched a new wireless headphone device called AirPods so people can still listen to music and audio files on its new smartphone. Apple says the AirPods are powered by new ultra-low power Apple W1 chip. 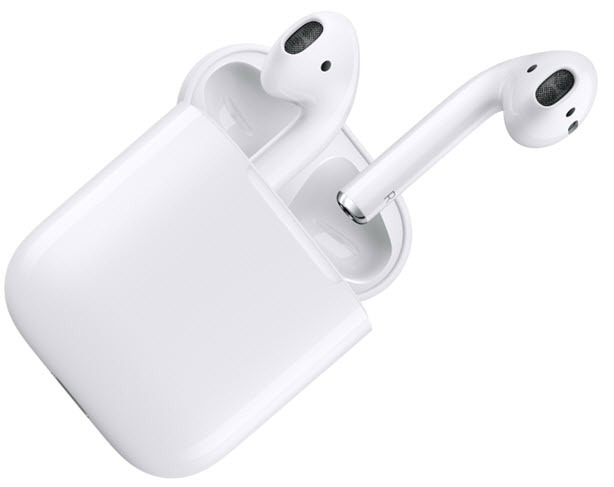 Apple's Philip Schiller says in a statement, "AirPods are the first headphones to deliver a breakthrough wireless audio experience, and with the new Apple W1 chip they deliver innovative features including high quality sound, great battery life and automatic setup. AirPods are simple and magical to use, with no switches or buttons, automatically connecting to all your Apple devices simply and seamlessly, and letting you access Siri with just a double tap. We can't wait for users to try them with iPhone 7 and Apple Watch Series 2." Apple says the AirPods can detect when you have them in your ear and only plays when you are ready to listen. The AirPods deliver up to five hours of listening on one charge. The charging case holds additional charges for over 24 hours of total listening time. The new AirPods are already getting some early good reviews. A CNET review says they will will change the headphone market. Critics say removing the headphone jacket gives Apple a way to charge its customers more by selling them AirPods. AirPods will arrive on apple.com and in Apple stores starting in October. They will cost $159. AirPods will work in Apple devices running iOS 10, watchOS 3 and macOS Sierra.